In Solution Explorer, under the list instance node, open the Elements.xml file. Deploy a solution and you will find nice promoted links web part in the app default page! Cross-site publishing is one of the powerful new capabilities in SharePoint 2013. It enables the separation of data entry from display and breaks down the container barriers that have traditionally existed in SharePoint (ex: rolling up information across site collections). I’m a huge proponent of SharePoint Online. After visiting several Microsoft data centers, I feel confident that Microsoft is better positioned to run SharePoint infrastructure than almost any organization in the world. SharePoint Online has very close feature parity to SharePoint on-premise, with the primary gaps existing in cross-site publishing and advanced business intelligence. Although these capabilities have acceptable alternatives in the cloud (as will be outlined in this post), organizations looking to maximize the cloud might consider SharePoint running in IaaS for immediate access to these features. The new SharePoint app model is fully supported in SharePoint Online and can be used to deliver customizations to SharePoint using any web technology. New SharePoint APIs can be used with the app model to deliver an experience similar to cross-site publishing. In fact, the content search web part could be re-written for delivery through the app model as an “App Part” for SharePoint Online. Although the app model provides great flexibility and reuse, it does come with some drawbacks. Because an app part is delivered through a glorified IFRAME, it would be challenging to navigate to a new page from within the app part. A link within the app would only navigate within the IFRAME (not the parent of the IFRAME). Secondly, there isn’t a great mechanism for templating a site to automatically leverage an app part on its page(s). Apps do not work with site templates, so a site that contains an app cannot be saved as a template. Apps can be “stapled” to sites, but the app installed event (which would be needed to add the app part to a page) only fires when the app is installed into the app catalog. The script editor web part is a powerful new tool that can help deliver flexible customization into SharePoint Online. The script editor web part allows a block of client-side script to be added to any wiki or web part page in a site. Combined with the new SharePoint REST APIs, the script editor web part can deliver mash-ups very similar to cross-site publishing and the content search web part. Unlike apps for SharePoint, the script editor isn’t constrained by IFRAME containers, app permissions, or templating limitations. In fact, a well-configured script editor web part could be exported and re-imported into the web part gallery for reuse. Cross-site publishing leverages “catalogs” for precise querying of specific content. Any List/Library can be designated as a catalog. By making this designation, SharePoint will automatically create managed properties for columns of the List/Library and ultimately generate a search result source in sites that consume the catalog. Although SharePoint Online doesn’t support catalogs, it support the building blocks such as managed properties and result sources. These can be manually configured to provide the same precise querying in SharePoint Online and exploited in the script editor web part for display. An easier approach might be to directly reference a list/library in the REST call of our client-side script. This wouldn’t require manual search configuration and would provide real-time publishing (no waiting for new items to get indexed). You could think of this approach similar to a content by query web part across site collections (possibly even farms) and the REST API makes it all possible! The content search web part uses display templates to render search results in different arrangements (ex: list with images, image carousel, etc). There are two types of display templates the content search web part leverages…the control template, which renders the container around the items, and the item template, which renders each individual item in the search results. This is very similar to the way a Repeater control works in ASP.NET. Display templates are authored using HTML, but are converted to client-side script automatically by SharePoint for rendering. I mention this because our approach is very similar…we will leverage a container and then loop through and render items in script. In fact, all the examples in this post were converted from display templates in a public site I’m working on. Even one of the more complex carousel views from my site took less than 30min to convert to the script editor approach. SharePoint and Dynamics CRM, a marriage made in heaven? As if! You’d think this is a simple topic. SharePoint, with all its extendibility and connectivity, should be the perfect tool for tracking all your customer related content in conjunction with tracking information in Dynamics CRM. But reality looks rather grim. The SharePoint connector from Microsoft provides very limited logic as to where to store documents and does not scale well at all. If you have more than a mere 5000 contacts you’ll already start feeling the pinch. More on that later. Also you may have a business portal with Dynamics AX and an enterprise portal with Dynamics GP, both give users the ability to interact with business data using a SharePoint dashboard approach. But what about the customer portal for Dynamics CRM? Looks like the Dynamics CRM development team did not read the memo, and there is no out of the box solution to this scenario. So that’s what we at Professional Advantage are building right now, a customer portal in SharePoint for Dynamics CRM. The foundational concept is that no matter what tool you use, SharePoint or Dynamics CRM, you can get at the most critical information needed for the task at hand. That means not just storing unstructured data (ie documents) in a folder in SharePoint, but auto-tagging those documents with the customer and opportunity they relate to. Tagging them with supporting metadata, like the industry sector and customer region automatically. Generating a dashboard that will allow staff to easily see all documents relating to an opportunity, grouped by type and security classification while also having an overview of the customer’s status, such as open cases, contact details and latest billing alerts. A place for support staff to easily get at infrastructure details so they can better support the customer and store reports and supporting material against the client. A place for consultants to manage customer projects, store deliverables and contractual documents and also track project status and financial information. A place where sales and marketing can perform searches across industry and region. Where they can access past deals and case studies easily by drilling down on common metadata. And finally, a place where the customer can engage us, collaborate on projects, check on outstanding cases and get copies of legal documents. How are we doing it? Without giving away too many secrets, I can tell you that several components come together: a CRM plugin which hooks into the document management module and creates not a folder but a whole site for a new account. Using some CSS magic and html tweaks, we embed parts of the site directly into the document management views of accounts and opportunities. A SharePoint site definition which creates several dashboard style pages with standard BCS web parts, custom filter web parts, lots of xsl and jquery and some event handlers. A series of library event handlers to take care of the auto-tagging of documents placed against a customer/opportunity. A series of search pages allowing staff to search across multiple customers to find documents for sector, product, area or other custom criteria. And most importantly, a flexible web service which allows the CRM data to be surfaced in tags, lists and web parts on the customer portal through BCS driven external content types. Add a claims-based login mechanism using Azure for customer access and strict security and governance guidelines on what content is shared with the customer through designing the information architecture with compartmentalisation in mind and you have your customer portal for Dynamics CRM! 1. The samples Microsoft provide are rudimentary at best and don’t scale! The default CRM/SharePoint plugin creates a new folder for each entity. Once you have more than 5000 contacts you can say goodbye to WebDAV access to that data. Say goodbye to performance. Say goodbye to simple navigation. More importantly, say goodbye to data management concepts! Sure you can increase the thresholds but they are there for many good reasons, which I won’t go into today. So? Build your own which also has scalability in mind. We effectively sucked the creation logic out of the plugin into a web service which also takes care of creating new site collections in new databases for every 1000 new customers. That way we have much more control over storage allocation and can manage customer bases exceeding a million with terabytes of data. 2. The sample CRM proxy that comes with the SDK does not work that well with BCS. You’ll notice that BCS will try to add the “substringof” parameter to the query for BCS filters. That parameter is not supported by the current implementation of the SDK. Not good. So you’ll need to build your own filter mechanism, and the SDK proposes a LINQ approach. Which in turn would be very scary as the default tries to return all records against which you then do a filter in-code. Grrrr. A much better approach is to build your own implementation of a proxy. Add your own custom functions which in turn execute queries against the CRM organization web service. When building your web service, you can chose either the WSDL or the WCF OData approach for both your web service and the CRM service endpoint you connect to. For the final endpoint (ie our own CRM proxy service) we chose WSDL, simply because that format is understood by SharePoint Designer (OData services must be registered and modified via a BCS model) and allowed us much faster prototyping when designing the external content types. 3. So you want to pull BCS data onto a page and only display the correct account information without needing to use query strings everywhere? Create your own filter web part which uses the ITransformableFilterValues interface. That way you can create your own logic as to where the parameter comes from. Maybe from the site property bag? Maybe from a regex you run over the URL? That’s up to you now. 4. Finally, if you ever try to provision web part connections using the itransformablefiltervalues in your site definition or feature, then I recommend staying away from embedding a WebPartConnection into your onet.xml of elements.xml file as some would suggest. Instead take the cheeky but much simpler approach of embedding the final ASP.Net markup directly in the page you are provisioning. (Extract it from your prototype using SharePoint designer) This works like a charm as long as you specify an ID on your AllUsersWebPart and use that ID in the on-page markup. Remember to check out CRM and SharePoint Online at the respective Microsoft sites……. New “Spotlight On” Web Part Released and Available!! The “Spotlight On..” Web Part selects a random entry from the specified Sharepoint Library and displays a picture, a title and an abstract of the selected person or item. enable or suppress the “Details..” URL. If you decide to create a new Sharepoint list to store the Spotlight entries, create a new Sharepoint Picture Library anywhere in the Sharepoint site collection (the web part is able to access any picture library within the site collection). You also can use a Sharepoint List (as opposed to a picture library). In this case please add the pictures as list attachments. You can alternatively specify a “Field Template” by entering the desired Library fields (surrounded by curly braces). You can specify HTML tags and CSS styles to freely format the text. The above example assumes that the Sharepoint Library includes a “JobTitle”, a “Description” and a “Bio” column. Details URL Field Name: (optional) Enter the desired Library Column name that contains the Detail page links (Default=”DetailURL”). Leave this field empty if you don’t want to provide a detail link. If you want to automatically link to the corresponding Sharepoint List Detail View page, enter the keyword “DetailView” into this field. If you want to automatically link to the corresponding user’s “MySite” page, enter the keyword “MySite” into this field. Open Details Link in new window: opens the link in a new browser window. Details Caption: allows to localize the “Details..” link displayed in the lower right part of the web part (if a “Details” link is specified). Image Height: specify the image height in pixels. Enter “0” if you want to use the default picture size. Background Color (optional): To set the desired Web Part Background color, enter either a HTML color name (as eg. “yellow”) or a hexadecimal RGB color value (as eg. “#ffcc33”). Leave this field empty if you don’t want to use a specific background color. Show specific Entry: optionally enter the List ID of the List Item to be displayed. License Key: enter your Product License Key (as supplied after purchase of the “Spotlight On Web Part” license key). Leave this field empty if you are using the free 30 day evaluation version. You can check the evaluation period via the web part configuration pane. New “Focus On…” Web Part Released!! The “Focus On…” Web Part selects a random entry from the specified Sharepoint Library and displays a picture, a title and an abstract of the selected person or item. The Web Part can be used with Windows Sharepoint Services V3, MOSS 2007, Sharepoint 2010 and Sharepoint 2013. Abstract Field Name: Enter the desired Library Column name that contains the abstracts (Default=”Abstract”)You can alternatively specify a “Field Template” by entering the desired Library fields (surrounded by curly braces). You can specify HTML tags and CSS styles to freely format the text. Contact me now for this awesome Web Part! This is a SharePoint-hosted app for SharePoint that uses JSON with Padding (JSONP) to retrieve data from a proxy page on a Windows Azure Web Site. 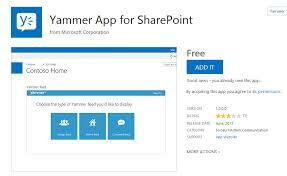 The sample contains two solutions, one for the App and one for its use on a SharePoint page. The App deploys the JSONPClient App part for SharePoint. The app part gets the feed data from the proxy page by using JSONP, and then displays the data. Maximize the power of SharePoint with Yammer and turn business collaboration into a social, mobile, and engaging experience. Whether it’s My Sites or Team Sites, Yammer deeply integrates with SharePoint 2010 to add a real-time social layer to core SharePoint capabilities. Engage in team and company-wide conversations, collaborate around files and projects, and become more productive by using SharePoint and Yammer together. And when you’re on the go, stay connected to conversations happening inside SharePoint with Yammer mobile applications. » Embed virtually any Yammer feed (including My Feed and Group Feeds) into SharePoint sites to facilitate team and company-wide conversations. » Send private messages directly to one or more coworkers at a time and keep track of these conversations in a separate Private Messages tab. » Manage new messages, @mentions, replies and more in a separate Notifications tab. Single Sign-On Leverage SharePoint authentication credentials to simultaneously log into Yammer through a single entry point. Admin Configurations Manage the Primary Yammer Web Part using SharePoint’s built-in Web Part controls and templates. Choose to configure read-only Yammer feeds so that users without Yammer accounts can also view conversations. Light Embeddable Feeds Embed a lightweight Yammer mini feed anywhere in SharePoint to view and keep track of relevant discussions without disrupting your workflow. Click-back to the Primary Yammer Web Part to get involved in the conversation. Document Integration Send links to documents from SharePoint to Yammer feeds for real-time collaboration. Federated Search Find the information you need fast with relevant Yammer messages displayed side by your SharePoint search results.